Despite Uganda’s impressive economic growth in recent years, living conditions for large sectors of the population remain tough and many children lack health care, education, and a secure and stable childhood. Kakiri is a small town of about 6,000 inhabitants located in Wakiso District in Central Uganda, just 30 km from the capital Kampala. Agriculture is the main economic activity of the region. Despite its location so close to the capital, Wakiso District is one of the poorest areas in Uganda. The population is constantly expanding, as people from all over the country migrate here in the hope of finding work. This has led to an increase in informal settlements where living conditions are precarious and basic services, such as sewage and running water, and solid waste management in particular, are often not available. Sometimes houses are also built on wetlands, which are prone to flooding and become unsafe during the rainy season. Many families live in desperate poverty, especially those headed by single women. The rate of HIV/AIDS in the region is also higher than the Ugandan average. Children are hit the hardest by these circumstances and many of them do not have access to good quality education or health care. This means that it is incredibly hard for them to escape the cycle of poverty as adults. Over 60,000 children in Wakiso have lost one parent, and 20,000 have lost both their parents. The leading cause for this is AIDS. 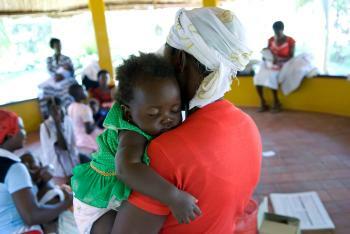 In Uganda, children who have lost the care of their parents are usually taken in by their extended family. However, these families often struggle to meet basic needs already, and often cannot cope with extra mouths to feed. There is also a preference for taking in girls, as they can help in the household and contribute to the family income sooner by marrying young. This means that boys’ education is generally given preference over that of girls. The level of illiteracy and the school dropout rate are very high amongst girls, also due in part to early pregnancy. Overall, an estimated 50 per cent of the local population drop out of school before completing primary education. Early marriage remains common in Uganda, with almost half of all girls married before their eighteenth birthday. These girls usually have little education, little independence and freedom, and are underrepresented in political processes. Their needs often go unheard and they are marginalised. They lack the start-up capital, qualifications and support to generate sufficient income, and going back to school or training is often unaffordable to them. SOS Children’s Villages began its work in Kakiri in 1991. In recent years, we have expanded our family strengthening programme in the region so as to reach as many struggling families as possible. The aim is to alleviate hardship and maintain family stability so that children will be safe and protected and grow up in a loving home. The SOS Social Centre in Kakiri ensures that children have access to essential health and nutritional services, as well as education. We assist parents by providing guidance on income-generating skills and parenting practices, as well as counselling and psychological support where needed. In cooperation with local organisations, we also work towards strengthening the support systems for vulnerable families within the community. The SOS Medical Centre attends to over 11,000 patients a year, providing basic medical care, preventive medicine, and a voluntary testing and counselling centre for those affected by HIV/AIDS. All services are open to the community, enabling many people to receive treatment who otherwise could not afford it. For children from the region who are no longer able to live with their parents, 13 SOS families can provide a loving home for up to 130 children. In each family, the children live with their brothers and sisters, affectionately cared for by their SOS mother.The children attend the SOS Kindergarten in Kakiri together with children from the neighbourhood, which ensures that they are integrated into the local community from a young age. The children then go on to complete their primary education at the SOS school, which is attended by almost 500 pupils from the region.